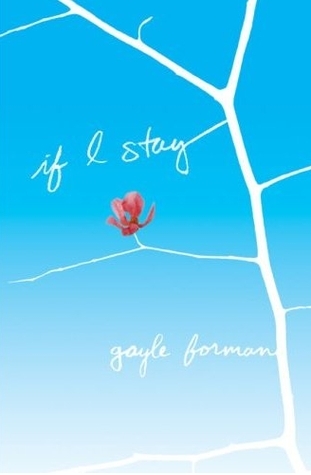 This is my original review of If I Stay and Where She Went by Gayle Forman. I’ve since reviewed the film adaptation of If I Stay and compiled a list of 15 YA novels for fans of If I Stay. Mia begins a normal day in the Hall household, happy that school’s been called off for snow though the weather won’t prevent them from going on a family outing–only they never make it to their intended destination. Mia’s parents and younger brother are killed in a car accident that leaves her in a coma. The story unfolds as Mia decides whether or not to stay or go. If I Stay is a YA novel with heart. Some YA fiction can come across as condescending or trite, preachy or unrealistic, but this one is well-written but approachable and a tear-jerker without being sad simply for the sake of it. Though I was initially skeptical about a story narrated by a girl in a coma, I was completely able to suspend belief and be right there with Mia, watching her friends and family grieve. Mia’s life revolves around music; she’s a gifted cellist, and the description of her playing, how music feels to her, was riveting and inspiring. Music is what brought Mia and her boyfriend Adam together. He’s the leader of a popular indie rock bank, Shooting Star, and they bond over their mutual love for music. Their relationship is realistic, not angsty or overly-dramatic. They have differences and conflict, like any couple, and there are fits and starts to their relationship. But they work through their issues. My favorite scenes of the book are when Mia recounts their first date, a trip to the Yo-Yo Ma concert, and a fireside jam where Mia’s rocker parents and friends and Adam convince Mia to bring her cello out and play with them. Gayle Forman writes with smooth, simple prose, without unnecessary description. Each scene adds to our understanding of the characters, who are all well-rounded and full of depth in their own right. This was a book I read in one evening, curled up on the sofa, unable to put it down until I was finished. Since I’m an aspiring author myself, it’s sometimes hard for me to lose myself in a book, because I approach it as a learning process, paying attention to things like scene transitions and POV and tense, but I was fully absorbed in this story. 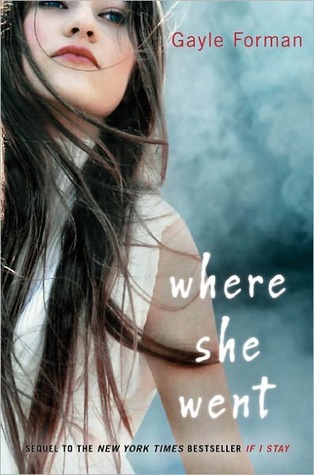 Where She Went, the sequel to If I Stay, is narrated by Mia’s boyfriend Adam, and picks up three years after Mia decided to stay in this world, despite the loss of her family. Not long after her recovery and her first year at Julliard, she ends her relationship with Adam with no explanation, breaking his heart. Adam channels his heart ache into dozens of new songs that become the album Collateral Damage, which has catapulted his band Shooting Star to super-stardom, which isn’t the fun ride he’d thought it would be. The songs weren’t exactly cathartic and he feels cut off from the band. Though he’s got a new actress girlfriend, he’s still pining for Mia, his first love. As if fate has brought them together the way that music brought them together in the first place, Adam is in New York City on the eve of his tour, and happens to catch Mia’s show. They embark on a tour of the city, getting to know the adults they have become, as Adam recounts his downward spiral in flashbacks. It isn’t an instant reunion; they have things to say, issues to work through. It would have been easy for Adam’s voice to come off as whiny or emo. But Gayle Foreman’s beautiful writing captures his pain and manages to make it just as moving as Mia’s story without trivializing the grief she has obviously dealt with after her horrific accident and the loss of her family. I love Mia for her strength. Her determination to rise to the top of the music world is admirable. Though she acknowledges her past treatment of Adam was unfair, she knows that it was what she had to do to in order to deal with her grief. You can’t blame her, or Adam, for the pain they’ve both gone through. These two books are heartfelt stories of young love, family, friendship, and the grieving process. I’d recommend them to any fan of contemporary young adult romance, and I’m going to read Gayle Forman’s previous book, Sisters in Sanity, and anxiously await any new novels. Her writing style is beautiful and inspiring. wow this is very moving!